Dell XPS ultrabooks are beautifully designed, delivers high performance and made of premium quality. The XPS 14 is one of the heaviest “ultrabook” in the market. It weighs 2.1kg, while most competitors would be pushing for a weight below 1.6kg. But it offers one of the longest battery life and large 14-inch bright LED display that aggressive road warriors will truly appreciate. Despite its hefty weight, the XPS 14 pushes the boundary for premium design, covering every inch of the laptop, even the base. The body is made of aluminium, the display panel is fitted with edge-to-edge Gorilla glass, the keyboard layered with silicon for a comfort feel. The base, also covered with silicon, has a removable aluminium plate that reveals the unsightly but important serial numbers of the Windows OS and the XPS 14 unit. There is also a hidden button which, when pressed, displays the remaining battery indicator. Battery life is touted to be 11 hours, which I would say is really far-fetched unless you leave the laptop on running without doing anything. A more realistic battery life would be about 7 hours doing normal productivity work and Internet activities, which itself is already very impressive. The trackpad is generously large and very responsive, very usable. Dell’s trackpad driver throws in a few additional finger gestures that improves navigation. For instance, a 3-finger swipe up/down will toggle among the Internet browser tabs, and the 3-finger swipe left/right will move the browser history forward and backwards. The backlit keyboard is a much-appreciated convenience when using the laptop in the dark. As for the connectors, XPS 14 has most of the connectors located on the left. AC adapter, Ethernet, HDMI, DisplayPort, and 2 USB 3.0 ports. On the right, there is an SD card slot, headphone jack, and the Kensington lock. The Ethernet port is rather special: to keep to the slim profile design, Dell designed the port with a spring to expand before inserting the RJ45 connector. Once the connector is removed, the Ethernet port closes back. Another thoughtful design detail for the XPS 14. The sound quality is impressive for a laptop. The XPS 14 audio driver powered by Wave MAXXAudio allows user to tweak the speakers to produce sounds with clear treble and firm bass. The keyboard actions are accurate and firm, and I can achieve a quiet typing response. The screen is very bright at 400 nits, its colour tone appears quite pleasant though still not gamma-accurate, and images appear so sharp that I notice more pixelation than I would on other monitors. 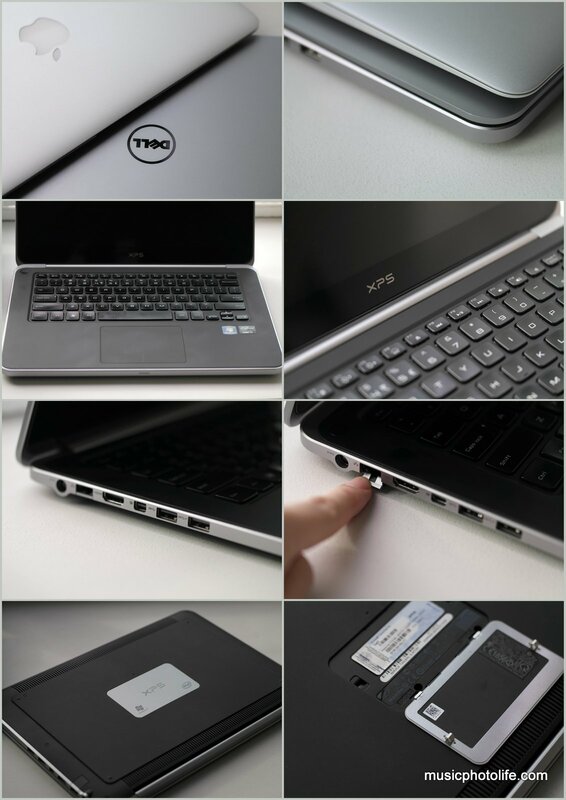 The hidden feature below the ultrabook: press the round button to check battery. I thought the XPS 14 contains quite a lot of positive usability features as mentioned above. But as always, it could have been better if the following issues do not occur. Weight. It’s just too heavy for an ultrabook. But what you get is the extra battery life and larger screen. Reflective screen. It’s just too reflective and marrs your visibility when there are bright light sources behind you. Heat. It can get rather hot at the base of the laptop even when performing light activities like Internet surfing. Usage wear. The silicon-rubber surface coat around the keyboard might not handle well with age and dirt. LED indicator During Sleep Mode. While the laptop boasts fast wake-up from sleep, I am compelled to put the XPS 14 to hibernation more often simply because of the bright pulsing LED indicator during sleep mode. Only 2 USB Ports. The XPS 14 is huge enough to fit 4 USB ports, so I wonder why they stop at 2. The Dell XPS 14 is a great-looking portable ultrabook laptop. Bright and large screen, good keyboard with backlight, responsive and accurate trackpad, standard-size connectivity ports, and long battery life. I really enjoy using the XPS 14, an excellent premium computing companion, but wished the weight can be cut down by a fraction (I suppose the XPS 13 is more suited for my requirements). Prices start from S$1399 (as at Sep 2012).